Best Reasons to Live in the Pocono Mountains- Ultimate Skiing At Your Backdoor! Are you irresistibly drawn to snow-topped mountains, crisply groomed trails, short lift wait-times, and the whisper of skis through the midst of a winter wonderland? Me too! And guess what…. The best kept secret of the northeast is the winter ski haven nestled within our very own Pocono Mountain Region. So why spend thousands of dollars on unnecessary airfare when a skier’s paradise is right at your own backdoor? Whether your focus is family entertainment or action-packed adventure, the Pocono Mountains offers an array of skiing destinations – many of which offer snow-boarding, tubing, terrain parks, and cross country skiing as well. Here’s a list of our top-five picks for you to visit this winter! 1. Jack Frost Big Boulder. Located in Blakeslee, this dual mountain package deal has something for everyone. Big Boulder Mountain is a wonderful family destination while Jack Frost has gained a reputation for thrill-seekers looking for a challenge. 2. Camelback Mountain. Located in Tannersville, Camelback Mountain exists purely for enjoying winter to its fullest. It’s snow-making prowess and legendary service has made Camelback a choice family destination for over 50 years. 3. Blue Mountain Ski Area. Located in the southern Poconos only a short drive from Allentown, Blue Mountain Ski Area is fast developing a reputation as a cutting edge snow park. Featuring six-passenger high-speed lifts and the highest vertical in Pennsylvania, Blue Mtn. has got just what you need in ultimate ski entertainment! 4. Shawnee Mountain. Located in historic Shawnee on the Delaware, this ski destination offers 23 trails and an array of excellent children’s programs and beginner’s packages, not to mention the great terrain for more advanced skiers. Shawnee is known for service and hospitality. 5. Ski Big Bear. Located at Masthope Mountain, Ski Big Bear offers a fantastic combination of events, festivals and competitions throughout the season, and features a cross-country ski map for a quieter experience in the heart of the Pocono Mountains. So if chilly thrills and winter wonders are your cup of tea – you’re living in the right place! And if you’re out of town, why don’t you come visit the Pocono Mountains this winter – we’re thinking you might be back to stay! A very basic and essential human trait is the need to belong. We are genetically wired to live in family units, as part of a larger group – in a sense, a community. We take pleasure in these distinctive recognizable locations we reside in, and attach our warm feelings to them – the very definition of a sense of place. A strong sense of place supports a feeling of personal identity. By being a piece of a whole community, our own individuality is enhanced. We are unique and individual through belonging to a larger unit! The challenge that faces forward-thinking residential planners and builders of today lies with the creation of a sense of place within a new community, in an age where sprawl and the disintegration of our towns and cities is the norm. “Placeless” landscapes are those that have no special relationships or history with the area they are located within. Strip malls, gas stations, convenience stores, and giant housing complexes are prime examples of places without meaning. So what tools can residential developers use to create a sense of place within a community? • Utilize Physical Setting. This includes incorporating natural elements and original topographies into the design plan, as well as providing access to nature immediately adjacent to a developed area. • Utilize Recreational Grounds. Shared recreational grounds, such as playground areas, open spaces, and picnic pavilions can provide a shared sense of place and community belonging. • Utilize Neighborhood Covenants. Joint agreements between members of a community can go a long way to strengthen ties and a sense of pride in a locality, as well as protect the community against devaluation through neglect or misuse. • Utilize An Enhanced Entrance. An architecturally designed entrance will enhance sense of place and provide a communal visual point and a feeling of coming home. • Feeling of Attachment and Belonging. This reduces anxiety and stress in the individual’s daily life by giving comfort and a sense of being part of a larger unit. • Desire To Protect the Community. This feeling of responsibility is critical in providing a safe haven for future generations; we all strive to build a sense of place within a community for our children. • Enhanced Safety. The freedom for our children to roam in a safe environment, in the manner that many of the elders in the community used to, is a huge plus. • Access To The Environment. Access to the outdoors is critical in the stimulation of a child’s creativity and sensitivity to nature, as well as helping to build each child’s sense of place. Not only does an enhanced sense of place provide benefits to the community and the individuals within, it also helps to preserve the past history of an area. The Pocono Mountains region is ripe with a unique cultural heritage, and its own sense of place helps to promote cultural awareness and strong kinship ties among its inhabitants. In an environment as rich in cultural and environmental diversity as The Pocono Mountains, our residents convey the need for cutting-edge community design and residential planning through responsible land-use decisions. Does your residential community fit the bill? To find out more about the benefits of energy efficiency and green building please call Keswick Point, the region’s newest PRD, at 570-646-4646, email us at info@keswickpointe.com or visit our website at keswickpointe.com. There is much more to the Pocono Mountains than the wildlife, lakes, and endless outdoor fun. No one’s life is truly complete without a healthy old dose of…. Shopping! Hey, it’s one of America’s favorite pastimes afterall. The best news is that living in the Pocono Mountains does not mean shopping isolation at all. We have the absolute best of everything! The Crossings Premium Outlet Mall in Tannersville PA has all you could expect and more, including the beauty of the surrounding mountains. The mall incorporatess 100 stores, featuring such premium names as Coach, Ann Taylor, Banana Republic, Michael Kors, BCBG Max Arzia, and many others. Housewares, home furnishings, food, gifts, specialty items and children’s clothing stores round out the mall’s content nicely. You can spend the day perusing the various stores leisurely — or get all your holiday or birthday shopping complete in one fell swoop! If fabulous dining is something you enjoy, there are several restaurants nearby, as well as antique shops and family fun destinations if outlet shopping all day is not your style. Several nearby hotel accommodations offer “shop and stay” programs, which include gift certificates to any store centerwide. The Crossings offers a VIP program, with registration available online. By joining the program, you are eligible for great printable coupons for use in many of the stores. There is also a calendar of events to help you plan the best shopping excursion possible. Directions and outlet hours are also posted. There is no reason not to check out the Crossings Premium Outlets – you don’t even have to leave the beauty of the Pocono mountains! Natural Resource Conservation in New Home Construction – How Does Your Builder Rate? For over 200 years, Americans have been conquering Nature. We have held the belief that growth, development, sprawl, and business take precedence over all else – it’s been the American way. Thankfully, times are changing. We are noticing the decline of natural habits, open spaces, and the disappearance of the supply of our natural resources. We are recognizing the need for advance in building design and construction technique, in order to protect the natural environment. Many home builders are stepping up to meet the need for conservation and accountability head on! So how do you locate the best of the bunch? Like many of us, if you are looking to reduce your carbon footprint – as well as save on monthly utility costs, selectivity when choosing a new home builder is quite important. The good news is, many builders are constructing homes that are healthier for the environment and more cost-effective for homeowners. As the consumer demand for environmentally friendly homes increases, building greener homes is becoming a priority for many residential builders. Green building is here to stay! Natural amenities, such as woodlands, hedge-rows, slopes, rock outcroppings, and streams or ponds, cost nothing in their pure state and provide lovely views for homeowners and families. Green belts and other open spaces, if designed for physical and visual access, can enhance property values of nearby developable lands, as well as your own home’s resale worth. Forward thinking in design is the hallmark of a great residential builder – here are some things you should look for during your selection process. • Water Conservation Techniques. This is more than just the installation of low-flush toilets – an innovative builder can utilize such state of the art features as bio-swales and permeable paving to reduce stormwater runoff and direct it into natural areas where it can be released back into the natural watershed. Low-water landscaping and energy efficient irrigation systems are also a plus. • Open Space and Natural Habitat Preservation. Look for thoughtful design that is integrated throughout the entire development. An environmentally conservative approach – such as using natural features like paths, wild areas, and native vegetation that increases habitat value for wildlife – is an excellent indicator that your builder is thinking green. • Integration into Natural Surroundings. Has the builder chosen a site that fits into the larger scheme of its surrounding environment? For example, a community located in the heart of the Pocono Mountains should fit seamlessly into the pristine forested land by incorporating wooded areas, paths, and other natural features, and provide nearby access to hiking trails and other environmental opportunities. It is estimated that building an average 2,000 square foot home will produce approximately 7,000 pounds of waste if careful management is not utilized. That is nearly 4 tons of debris, not to mention the wasted dollars in material costs! Conventional building construction consumes large quantities of wood, water, metals, fossil fuels and other natural resources – so how do you know that your residential developer is carefully managing the construction process, and using these resources wisely? Here’s what to look for. • Use of Durable Products in Building. An example would be high quality roofing materials with warrantees of 40 to 50 years, or decking materials made of recycled plastic mixed with wood waste fibers that can last up to five times longer than wood decking, never needing to be treated or painted. • Use of Advanced Framing Techniques. There are many well established home building practices that involve the use of FSC-Certified wood, engineered lumber, and advanced framing techniques that can substantially reduce lumber requirements without compromising structural integrity, thus helping to conserve natural resources. • Use of Recycled Materials When Applicable. A developer well-versed in green practice will utilize recycled materials whenever possible. An example would be the use of high-volume recycled flyash in concrete (min. 25%) or ceramic or glass tiles that contain recycled or reclaimed materials in the construction process. • Energy Efficiency Ratings. The incorporation of energy efficient appliances and lighting systems is the hallmark of a forward thinking home builder. Homes should be independently Energy Star Certified for energy efficiency. The National Association of Home Builders has a rating system in place to certify homes according to the National Green Building Standard requirements. Ask your builder about their rating! Increasingly, residential developers and environmental professionals, along with local and state government officials, are recognizing the benefits of greater integration between man-made environments and nature. When cutting edge building design meets with the smart-growth practice of accountability during the construction phase, we have a win-win situation for homebuyers and the environment alike! In today’s shaky economy, “you’ve got to tighten up the belt wherever you can” is a popular mantra. Yet we’ve all felt the sting when something we thought was a great deal at the time turns out to be a bad investment a bit down the road. So let’s face it – cost-cutting when building homes is just a risky game. Envision your family’s dwelling place as an investment that needs, foremost, to endure for the long haul. The average home builder’s nightmare begins when trying to evaluate the quality of construction while maintaining a tight or shrinking budget. The “bad dream” sensation swells with the realization that the home is constructed from thousands of pieces of materials – all items that can warp, contract, crack or tear. The worries mount because inside, everyone knows that a skilled craftsman may be able to make something cheap look good to the buyer – but will it stand the fabled test of time? Likely not. At Keswick Pointe, you are not the average home builder! Every one of our homes is constructed with consistent quality materials that will endure for a lifetime. We only utilize the best names in workmanship because we are fully invested in our clients’ long-term satisfaction. Here are some of our favorite tried-and-true manufacturers that you can count on, compliments of us, nightmare-free! Why Anderson? The Low-E glass works like sunblock to protect your home and furniture from ultraviolet light. They utilize natural wood to create beauty that is timeless and enduring – with a tough protective shell that will never need repainting. The Anderson Company is renowned for climate control and the potential of hearty savings on heating and cooling costs. And it is well known that Anderson Windows will add to the resale value of your home. Trane Heating & Cooling Systems. Consistent comfort a must have? That’s why we go with Trane from start to finish. A Trane matched HVAC system combines superior components that are made to work seamlessly together. This means the least in repair costs and the most in energy efficiency. The legendary Trane name can bring your family enhanced air quality – and a healthier lifestyle as a result. What says style, quality, and craftsmanship more than the Kohler name? Kohler fixtures consistently provide distinctive style, an array of choices, and uncompromising performance. These fixtures are utilized in every Keswick home, including a sleek Kohler whirlpool tub in your master bathroom. Enjoy the experience of powerful, directed massage jets as you unwind and revitalize after a hard day’s work. Concerned about the durability of your new home’s exterior components? You absolutely should be! But worry not, because CertainTeed roofing and siding materials are world-renowned for superior quality and innovation in their building solutions. They come with a Lifetime warranty. And CertainTeed roofing products meet National Green Building Standards for environmental responsibility. Trex Decking. Want the finest in Outdoor Living? Oh yeah! Trex is the industry leader in wood-alternative decking – with no splinters, no rot, no painting, and no fuss. It’s simply the best… and did you know that Trex materials are made from a unique combination of reclaimed wood and plastic? It’s environmentally friendly, manufactured by an outstanding “green” company! Other outstanding names utilized in our homes’ construction include: Glen Gary Brick, Jeld Wen doors, Shaw T & G hardwood, Dal-Tile ceramic floors, and many more. All these manufacturers have this in common: superior quality and enduring craftsmanship. That’s why we have selected them for each of our homes, every time. No worries, no stress, no nightmares. Just enjoy the best in a new Keswick Pointe home! Best Reasons To Live In The Pocono Mountains – Our Fabulous Fall Festivals! You’ve chosen to live in the Pocono Mountains for some very good reasons. We are willing to wager the spectacular bounty of autumn is on top of the list! Whether you are an outdoor enthusiast or a food and wine connoisseur, there is always something amazing to do in the Poconos. Why stay home when the world is at your fingertips? Take your friends, take your family, or wander the pristine trails in solitude, but check out our selections for a fabulous fall itinerary! View the Fall Foliage. You are living smack-dab in the middle of the finest palette the season of autumn can produce. The quaint little Victorian town of Jim Thorpe is renowned for its Fall Foliage Festival – and it happens every weekend in October! Visit for a leisurely day of strolling streets filled with dozens of artists, craftsman, musicians, and chefs. Take a ride on the Lehigh Gorge Railway to view the turning leaves while you are there – you won’t believe your eyes! Check Out a Harvest Festival. Whatever your neck of the Poconos, there is bound to be a harvest festival nearby – agriculture is a huge part of Pocono Mountain culture! Quiet Valley Living Historical Museum offers a lovely fall festival each year. View agricultural life as it used to be – the entire PA German farm is in period and operates exactly how it did centuries ago. Shawnee Mountain offers an annual Autumn Timber Festival in October – definitely worth checking out! Take the Kids for Pumpkins. This is a tradition for many families, but in the Poconos, you get to do it up big time! Visit the Great Pocono Pumpkin Festival at Country Junction, the world’s biggest country general store. If you don’t have children, take a date and treat the kid inside you! The entire month of October is dedicated to fun rides, great food, scary attractions, animal petting zoos, and much, much more. Did I mention pumpkins galore? Go Get Scared! Who can resist the draw of Halloween? Visit the Old Jail Museum in Jim Thorpe for a historically scary tour, or go to downtown Saylorsburg to be scared witless at the Hotel of Horror. If you like something a bit tamer, opt for a haunted hayride or an old-fashioned treat or treat walk in the town of your choice! Whatever your pleasure, autumn in the Pocono Mountains should not be missed. The tastes, sights, sounds, and scents are truly spectacular. Mark your calendar now, so you don’t miss a thing! Modern building philosophy has of late embarked upon a transformation – the turning away from the urban sprawl trends of the past to embrace the environment through green building, conservation, and the desire to leave as much of our natural surroundings possible intact for future generations to enjoy. Gifford Pinchot, the first Chief of Forestry for our State and twice Governor of Pennsylvania, was a man whose ideas were well beyond his time. His views supported the idea that the conservation and the preservation of our state’s amazing natural resources was of upmost importance. And the exquisite beauty of the Pocono Mountains region and surrounding areas are testimony to that enduring philosophy. Visit the full calendar of events online to plan the best outing possible for your family. Touring the Grey Tower mansion and grounds is an interesting and unique way to learn about how one family shaped and influenced our conservation ideals and values, while experiencing what life might have been like in the early 20th century of Pennsylvania and the Pocono Mountain Region. Buying a new home can be an overwhelming endeavor, even if you’ve done it before. In tough economic climates such as we are experiencing today, home-buying can be a very good choice – or a financial nightmare. The best course of action lies in thorough preparation. Our Keswick Pointe’s Homebuyers 10-Bases Checklist will help guide you through the maze and into the light! 1. Do you have a lender on board? You must identify your buying power before you begin the search process. Many owners will not take you seriously – or even show you their property – without a letter of pre-approval from a lender. Interview a couple of lenders, then pick one and stick with them. Find a lender that won’t just tell you the maximum amount of a mortgage you can get, but instead, identify one that understands that qualifying for a certain amount and being able to make the payments are two different things. 2. Have you specified search criteria? Define your must haves, like to haves, and cannot haves. Do you need a garage? A particular school district? A basement? A large yard? How many bedrooms? The more details you can give a realtor, the easier it is for them to pinpoint properties that will not waste your valuable time. If you are not exactly set in your wants/needs, your agent can begin by showing you different homes with different features to help you get a better understanding of what you’d like in a home. 3. Do you love your real estate agent? Having a great relationship with a personable agent is critical. Make sure you talk on the phone regularly. Your realtor can also be a great source of information for a first time home buyer. Experienced agents may be quite up to date on the skill and technique of top-notch builders in your area. 4. Have you come up with a rating system? Making your own personalized scorecard, then taking it along while you view the house. It’s an excellent way to remember particular details later on, or when comparing properties. 5. Are you up to date on mortgage/real estate terminology? Knowing what a realtor/lender is talking about without having to ask for an explanation every other sentence will only increase your credibility. Brush up before you begin. 6. Have you familiarized yourself with area property values? This can be one of the most difficult aspects for new homebuyers. How do you really know whether a house is over-priced, right on the nose, or undervalued? A seasoned real estate agent can help you with this, but you may want to do some serious research before making any sort of offer. Unfortunately, there is no “suggested retail price manual” for a house. Therefore, it is impossible to give “standards” as to what is fair or normal. Every property stands on its own price and merits. 7. Have you arranged for a home inspection before closing? Experience and reputation is also important here. Any offer to purchase you make should be contingent upon (subject to) a whole house inspection with a satisfactory report. 8. Have you looked into homeowners insurance and home warranties? Since homeowners insurance is a long term expense, getting the best deal here can provide you some substantial savings over the long haul. Be sure to compare rates from several reputable complies. 9. Have you secured a closing agent or attorney? In general, the closing will be attended by all of the buyers involved and their real estate agent, as well as the closing agent or attorney, who has reviewed all of the components of the house sale and who will organize all the necessary paperwork. The closing will put the title to the house in your name, verify homeowners’ insurance on the property, commit in writing to the terms of the mortgage, and usually, put the keys to the house in your hands. 10. Have you begun to make your moving plans? If you plan to use a moving company, make comparisons and reserve time now. Moving is a huge, time-consuming undertaking – not to mention an extremely stressful one. If you’re a do-it-yourselfer – get all your strapping family members on board with the move! And there you have it – a superb 10-step plan to a smooth home-buying process. Keep it with you, and refer to it whenever necessary. Organization is key to a successful buying endeavor. Happy home hunting! If rugged climbs and breathtakingly beautiful waterfalls are something you think you would enjoy, then it is time to experience the Glen Onoko Falls Trail. This amazing haven rich with lore and history is nestled right into the pristine Southern Pocono Mountains Region of Pennsylvania. The hike may leave you a little out of breath, but the reward of seeing exquisite vista after vista is well worth your effort. As you wind your way up among the dewy rocks flanked by verdant rhododendron, you will find one gorgeous waterfall after another. Finally – you reach the zenith – and view the achingly lovely 75 foot waterfall where ancient lore says that Indian Princess Onoko threw herself from the top because she could not wed the brave she truly loved. Who can resist the lure of such a heart wrenching story? Be sure to pack drinks for the top! According to the Delaware & Lehigh National Heritage Corridor, “The Falls are located deep in a hollow near the southern terminus of Lehigh Gorge State Park. However, they are part of the PA State Gamelands so they are not patrolled or maintained by the Park. As such, the Falls are potentially dangerous. You should respect the area and enter at your own risk.” Be especially careful if you visit the trail in the wintertime – because slippery ice is a likelihood, and there are usually a couple of injuries every year due to that fact. Boots, crampons, and an ice axe should be part of your gear. The water remains a chilly 55 degrees even in summer. The resultant misty air and the sound of spilling water creates the illusion of being in another time and place. In several areas, there are even stone steps cut into the side of Broad Mountain. On a hot day, the river winds below, producing slow pools where it is easily accessible for a swim. Pack a picnic lunch and watch the crazy teenagers jump from the train trestle into the river below. Jim Thorpe is only a mile or two away, if you wish to stroll the quaint streets and visit the museums and little shops throughout the historic town as part of your outing. There is also access to the Lehigh Gorge State Park,which is well noted for its wonderful biking trails that run along the Lehigh River. Bicycle rentals and shuttle service are available throughout the area. 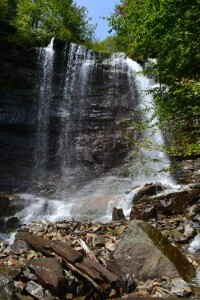 Glen Onoko falls is a Pocono Mountain treasure that should not be missed! For instructions on where to park, and how to access the trail, visit the Wildlandspa.org Website. In the past, the concept of purchasing a townhouse was something that single folks, or first time home owners struggling with their finances, opted to do. Modern building techniques and the desire for a low maintenance property with all the high-tech luxuries afforded by a single dwelling have put that old stigma to rest. Purchasing a new townhome might be the smartest financial investment you’ve ever made. And yet, you have to wonder – what would you have to sacrifice? 1. You don’t need to sacrifice space. For the same amount of square footage, you can get far more bang for your buck when you buy a townhouse. In fact, new townhouses can offer you MORE space than a comparably priced single family dwelling. Today’s floor plans are carefully orchestrated to create efficiency of space, and yet, convey a feeling of openness and size. Townhome builders now ingeniously design compact stairways and efficient hallways to give you the most square footage of “living space” possible. 2. Community amenities. If you opt to purchase a townhome within a homeowners association or planned residential development , you will have the benefit of being part of a “large neighborhood” as well as access to community recreation areas. If you are sacrificing the space of a large yard, this may be more than made up for through the outdoor amenities in your development. 3. Future rental/investment potential. With mortgage prices at a near historical low, investment in property can be a sound financial choice. If you decide to move on down the road, a townhouse can be a positive stepping stone. Potential tenants are usually more open to renting a townhouse with a homeowner’s association in place because it creates a near no maintenance environment for them whereas renting a single family home still comes with the responsibilities of ownership. Remember to keep in mind this future resale value when choosing a design plan. A one bedroom, two bath single-family home with a huge greatroom and kitchen may be perfect for you right now, but may be harder to sell down the road. When you buy a townhouse, it would be far better to have an additional bedroom or two sit empty (or use as an office, exercise room or even storage) than to not have it at all. 4. Energy efficiency. When the cold winds blow or the sweltering heat of mid-summer is blistering, modern townhomes are epitome of energy efficiency. Sharing wallspace with your neighbor can save you some significant bucks in heating/cooling costs. Newer townhomes are also built with green concept and superior quality materials than a comparably priced single dwelling that is 15 years older! 5. Better security. Because neighbors are quite close by, it’s more difficult for a burglar to break into your townhome unnoticed. The proximity of townhomes brings neighbors together to protect each other and also to be available for other non-emergency situations. So, is a townhome the very best option for you – right now? Many families consider a townhome as a great first option, but move on to a larger single family residence down the road. However, the luxurious feel of a new townhome may have you never wanting to leave again. It can be an excellent first time investment – and in this economical climate, townhomes are often priced to sell. Make sure you compare all your options to ensure that you make the right decision! There are certainly pros and cons to both types of dwellings. But if you do choose a sleek, modern, and efficient townhome, you are not likely to be disappointed! If you love the Pocono Mountains, click here for more information on the area.